The first of a three-part video (other parts below) features the address of Jean-Luc Mélenchon, former spokesperson for the French Left Party and initiator of the Movement for a Sixth Republic, at the 2014 year's Humanity Fair, which is hosted every year by the daily newspaper L'Humanité, of the French Communist Party. Mélenchon discusses how to build a movement against austerity that goes beyond the traditional left, an important issue in a country where the racist National Front is leading in the polls. Also appearing is Hamma Mammami, leader of the Communist Party of Tunisian Workers and the candidate of the Popular Front in 2014's presidential election. At the end there is a short interview with Jérôme Kerviel, a "rogue trader" who cost the Société Générale bank €4.9 billion, but who maintains that his superiors knew about and condoned his activities. Mélenchon and the Parti de Gauche (Left party) have been active in building solidarity with Kerviel. 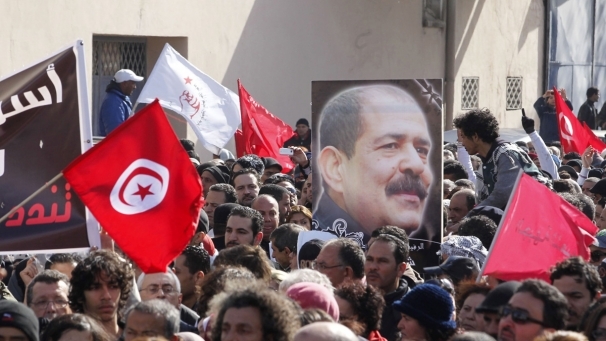 More than 1 million people mobilised to protest the assassination of Chokri Belaid. February 12, 2013 -- Links International Journal of Socialist Renewal -- Furious protests have exploded onto Tunisia's streets and a general strike has been called after the assassination of left-wing politician and lawyer Chokri Belaid on February 6. Belaid was head of the far-left Party of Democratic Patriots (PPD, he was previously leader of MOUPAD: see article below). His killing is Tunisia's first reported political assassination since independence. Belaid was gunned down outside his home. Only 12 hours before, he publicly denounced "attempts to dismantle the state and the creation of militias to terrorise citizens and drag the country into a spiral of violence", Al Ahram said on February 6. November 16, 2012 -- Green Left Weekly -- Abdel Jabbar Madouri (pictured above) has been a militant in Tunisia since his early secondary school days. He was jailed three times (in 1987,1993 and 2002) because of his political activism. After every arrest, he was tortured and then sentenced to more then 12 years in jail. Madouri spent four years in hiding during the Ben Ali regime. He was also deprived of the right to work or to obtain a passport. Madouri is also novelist and member of the League of Free Writers and some of his novels were banned by the dictatorship. Today he is member of the national committee of the Tunisian Worker’s Party and is editor of its newspaper Sawt Echaab (People's Voice). Green Left Weekly interviewed Madouri by internet with with the assistance of and translation from Arabic by Tunisian journalist Haithem Mahjoubi. January 12, 2012 -- International Viewpoint -- The 22nd congress of Tunisia’s UGTT trade union federation (Union Générale des Travailleurs Tunisiens, General Union of Tunisian Workers) was held December 25-28, 2011. A large part of it was devoted to the election of a new national leadership. The new executive bureau (EB) is clearly better than the old one. It is based on real activists involved in struggles, who are not corrupt. An alternative list had been constituted around those close to the federation’s former deputy leader. It includes some self-styled independents, of whom some were in reality close to the Islamists currently in power (about 10% of congress participants were estimated to be linked to the Islamists). The overwhelming majority of members of the new EB belong historically to the trade union left, and this is a victory for that left. Half of those elected are not, or are no longer, members of a party. This is for example the case with the new general secretary. He was part of the minority on the old EB and belongs to the democratic and left movement. He was a member of the Communist Party 20 years ago. November 26, 2011 -- Al-Thawra Eyewitness, posted at Links International Journal of Socialist Renewal with the author's permission -- I first met with Samir Taamallah, a former political prisoner and member of the central committee of the Communist Worker's Party of Tunisia (PCOT), in Tunis on October 4, 2011, to discuss the October 23 Constituent Assembly election and Tunisia's ongoing revolutionary struggle. The first part of the interview took place before the election. The follow-up interview part took place after the results were known. How is the election campaign going? 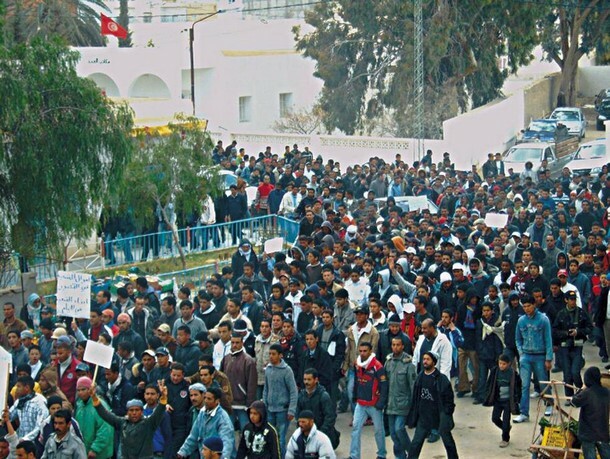 Mass protests in Tunisia, January 2011. Two and a half months have passed since the glorious revolution of January 14. During this period, the people have made significant progress through their struggle and sacrifice. The Communist Workers' Party of Tunisia on Libya: "The Tunisian revolution has spread to many Arab countries. Egypt's dictator fell, while authoritarian regimes in Yemen and Bahrain are fiercely repressing popular uprisings, in Bahrain, with the help of Saudi Arabia. Our neighbour, the Libyan people, rose up against their tormentors, but events took a bad turn with the intervention of the United States and its allies, under the pretext of protecting civilians. The US administration has hardly mentioned the killing of civilians in Yemen and Bahrain, as it has also never done regarding Gaza, Lebanon or Iraq and Afghanistan, countries it occupies. And didn’t Sarkozy support the Tunisian dictator until the last moment? February 14, 2011 -- The Tunisian revolution is the first of the 21st century. Its shock waves have shaken dictators and Western governments. But it has yet to overturn the ancien regime, and the neocolonial state apparatus that supports it. As an expression of popular unrest it has been fed by the anger of a diverse classes, at least until January 14, 2011. Since that date there has been increasing polarisation between the forces who back the revolution and those of the counterrevolution. Those on the latter side are attempting to safeguard their constitution and its institutions. With the collaboration with liberal fringes of the democratic movement, Western agents, Islamists and the leftovers of the ancien regime, they are trying to stem the social movement. The provisional government of "national unity" is peopled by former members of Ben Ali’s power structure. This includes a prime minister (from 1999), Mohamed Ghannouchi, who was the architect of neoliberal policies dictated by imperialist financial bodies. Este artículo fue originalmente publicado en inglés a www.greenleft.org.au. Después de 23 años de dominio dictatorial, el presidente tunecino Zine El Abidine Ben Ali fue forzado a dimitir y huir a Arabia Saudita el 14 de Enero debido a un levantamiento masivo. El alzamiento comenzó en 17 de diciembre en el pueblo provincial de Sidi Bouzid con un acto de desesperación individual. Mohammed Bouazizi, recién graduado que tenía 26 años y se ganaba la vida como un vendedor de frutas sin permiso de las autoridades. Después de ser abusado y humillado por la policía quien confiscó su carro de frutos, se roció con gasolina y se inmoló en frente de las oficinas del gobierno municipal. Esta declaración extrema contra la pobreza, la falta de oportunidad y la brutalidad de estado fue el motor de las protestas que se extendieron a través del país, a pesar de que la policía disparaba a los manifestantes y aplicaba gas lacrimógeno. Para el 27 de diciembre muchas protestas han estallado en la capital, Túnez. El joven Bouazizi murió de sus heridas el 4 de enero. Sin embargo, su protesta dramática ha impulsado un movimiento que a menos de un mes derrocó el régimen. February 7, 2011 -- Tlaxcala -- Fahem Boukadous is a journalist who was in prison when the people of Tunisia forced the dictator Ben Ali to flee the country. A member of the Communist Workers Party (often also referred to as the Workers Communist Party) of Tunisia (PCOT), he does all he can every day so that the great opportunity opened by the revolution will not be lost. The Workers Communist Party's Hamma Hammami. Photo by l’Humanite. January 31, 2011 -- On January 27, Mohammed Ghannouchi, the leader of Tunisia's "national unity" government, announced that 12 ministers linked to the former ruling party, the Democratic Constitutional Rally (RCD), would be replaced by independent figures in an effort to appease the mass movement that overthrew Tunisian dictator Zine El Abidine Ben Ali on January 14. Mass protests continue to demand that all members (and recently resigned members) of Ben Ali’s RCD party be thrown out of the government and for policies to fight the country’s crippling unemployment. Since Ben Ali’s overthrow, a key demand of the movement has been the establishment of a government with no ties to the old regime. After Ben Ali’s overthrow, a unity government was formed that included former opposition parties — but only parties that were legal under the dictatorship. RCD ministers remained in control of the government. Statement of the National Administrative Commission of the General Union of Tunisian Workers (UGTT) issued on January 21, 2011 (first published in English on MRZine). 1. The General Union of Tunisian Workers is a national organisation necessarily interested in political affairs, given its history of struggle during the colonial epoch and the period of the construction of the modern state, considering the dialectical links among economy, society, politics, and culture in the process of development, but out task has become more urgent than ever.